Aseptic and alopecic nodules of the scalp (AANS) is a new, little known, and probably underdiagnosed entity. It is characterized by asymptomatic multiple skin-colored dome-shaped nodules or cysts with sterile punctured material and negative cultures accompanied by nonscarring alopecia. We are reporting a rare case of AANS in a 26-year-old female. A 26-year-old woman presented with chief complaint of nodular lesions over the scalp for 2 months. Lesions were nonpainful and were associated with hair loss. There was no history of insect bite, trauma, or medical local procedures. 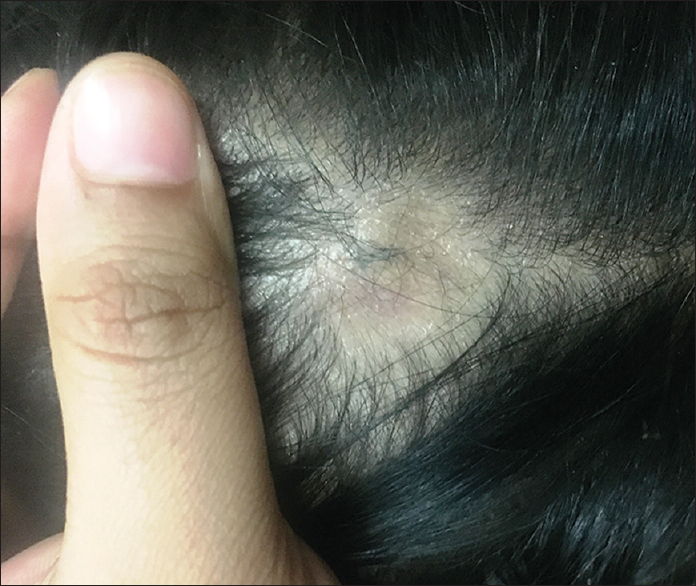 Cutaneous examination revealed two alopecic nodules in occipital and frontal areas of scalp. Nodules were nontender, dome-shaped, firm in consistency, size varying from 1.5 to 3 cm and associated with nonscarring alopecia with surrounding normal scalp [Figure 1]. 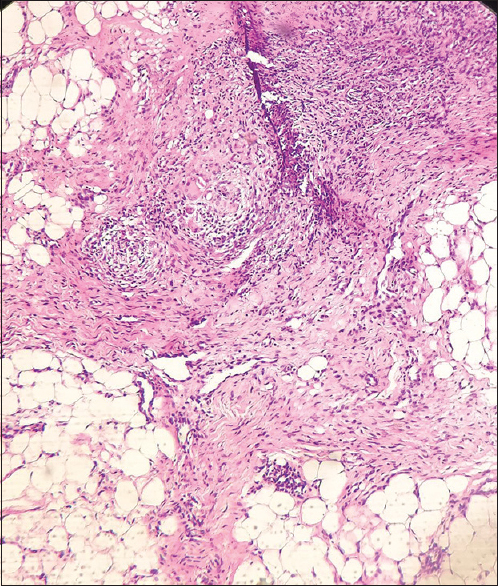 On histopathology, subcutaneous tissue showed chronic lymphoplasmocytic infiltrate and few multinucleated foreign body giant cell [Figure 2] and [Figure 3]. Specific staining for microorganisms with Periodic acid–Schiff, Giemsa, and Ziehl–Neelsen was negative, as were mycological and bacteriological cultures [Figure 4]. On the basis of clinical and histopathological findings, the diagnosis of AANS was made, and the treatment was started with doxycycline 100 mg twice daily, and after 1 month follow-up, nodular lesions subsided, and there was improvement in hair growth [Figure 5]. AANS is a rare entity first described in Japan in 1992 as “pseudocyst of the scalp” (PCS). In 1998, Chevallier reported three cases in France that he described as “noninfectious abscess of the scalp with alopecia.” Abdennader and Reygagnecoined the term AANS in 2009. This term characterizes the disease better because pseudocysts are not always present; however, the nodules are always alopecic and aseptic. Currently etiology of the condition is unknown. Some hypotheses refer to follicular occlusion as the cause of the nodule or pseudocyst formation or to a particular form of deep folliculitis leading to a nonscarring type of alopecia. Granulomatous reaction secondary to immune response caused by follicular alteration or a foreign body or some unknown factor has also been considered. The granulomatous infiltrate is probably located around the lower part of the hair follicle, beneath the bulge and this seems to be cause of nonscarring alopecia. AANS predominantly affects young males with mean ages between 20 and 30 years. Clinically, this condition is characterized by the presence of one or more dome-shaped nodules, mostly firm or fluctuant, associated with alopecia and normal surrounding scalp. The nodules are mainly located on the vertex and on the upper part of the occipital area. In general, AANS is asymptomatic, but there may be mild pain, itching, or discomfort. When material is obtained on puncturing the nodule, it can be serous, purulent, or yellowish, depending on the characteristics of the infiltrate and the type of vessel eroded by the infiltrate; yellow and pink aspirate indicates the erosion of a lymph vessel and blood vessel, respectively, and purulent material indicates the predominance of polymorphonuclear infiltrate. Cultures are negative in all cases. 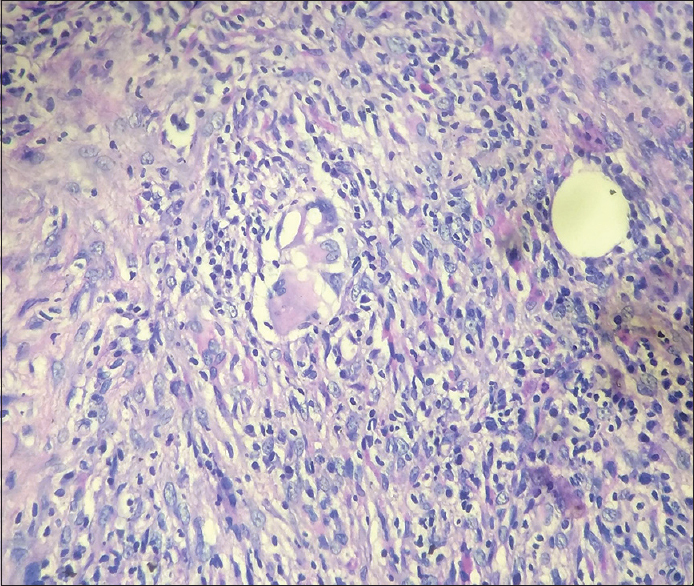 Histologically, these nodules exhibit mixed inflammatory infiltrates (lymphocytes, histiocytes, and giant cells) and in most cases granulomas in the deep dermis or pseudocyst-like architecture without a true wall. 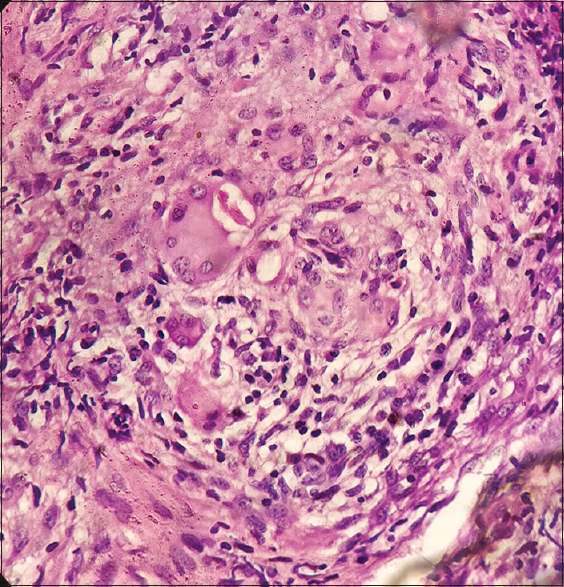 Histological differences are thought to be due to race-related differences in hair type or the changes in histology during the evolution of the disease., Pseudocyst formation seems to be a secondary change to inflammation, and it can also be related with duration and severity of the disease. On ultrasound, AANS shows a well-defined subcutaneous hypoechoic nodule and hence may prove useful in differentiating it from other disorders such as trichilemmal cyst, alopecia areata, folliculitis decalvans, and dissecting cellulitis of the scalp. Trichoscopic features of AANS are black and yellow dots, fine vellus hair, and broken hair shafts, but none of these signs are pathognomonic of AANS. In 2014, Bourezane et al. described two trichoscopic signs in AANS for the first time: “Eastern pancake sign” resulting in dilated follicular orifices and “comedo-like structures” resembling comedones corresponding to yellow and black dots described recently. Differential diagnosis to be considered are alopecia areata; inflamed trichilemmal cyst; bacterial and tinea infections; dissecting cellulitis of the scalp; congenital lesions such as aplasia cutis, triangular alopecia, and sebaceous and epidermal nevi; and benign and malignant tumors, particularly metastatic nodules of the scalp. Treatment modalities include doxycycline (100 mg/day), intralesional corticosteroids, and aspiration or drainage of the nodule., Cases of spontaneous regression have been described, and in general, surgical excision is not necessary. In conclusion, AANS is an emerging entity in the literature, is relatively unknown, and thus is likely underdiagnosed. In our case, young age of the patient, late onset of the lesions, presence of nodules with nonscarring alopecia, occipital location of nodule, absence of any bacterial, fungal or mycobacterial infections as evidenced by negative staining and culture reports and the presence of mixed inflammatory infiltrates including foreign body giant cells in subcutaneous tissue favored the diagnosis of AANS and ruled out other differential diagnosis. AANS responds well to treatment and easily manageable; hence, better understanding of this condition is necessary for proper treatment and to avoid unnecessary interventions. Fischer-Levancini C, Iglesias-Sancho M, Collgros H, Sanchez-Regana M. Aseptic and alopecic nodules of the scalp. Actas Dermo Sifi Liograficas Engl Ed 2014;105:208-11. Lázaro-Simó AI, Sancho MI, Quintana-Codina M, Viladomiu ED, Millet PU, Redonnet MS, et al. Alopecic and aseptic nodules of the scalp with trichoscopic and ultrasonographic findings. Indian J Dermatol 2017;62:515-8. Iwata T, Hashimoto T, Niimura M. A pseudocyst with inflammatory granulation tissue on scalp-pseudocyst of scalp. Jpn J Clin Dermatol 1992;46:9-16. Chevallier J. Alopecic and aseptic nodules of the scalp: A new entity? Nouv Dermatol 1998;17:181. Abdennader S, Reygagne P. Alopecic and aseptic nodules of the scalp. Dermatology 2009;218:86. 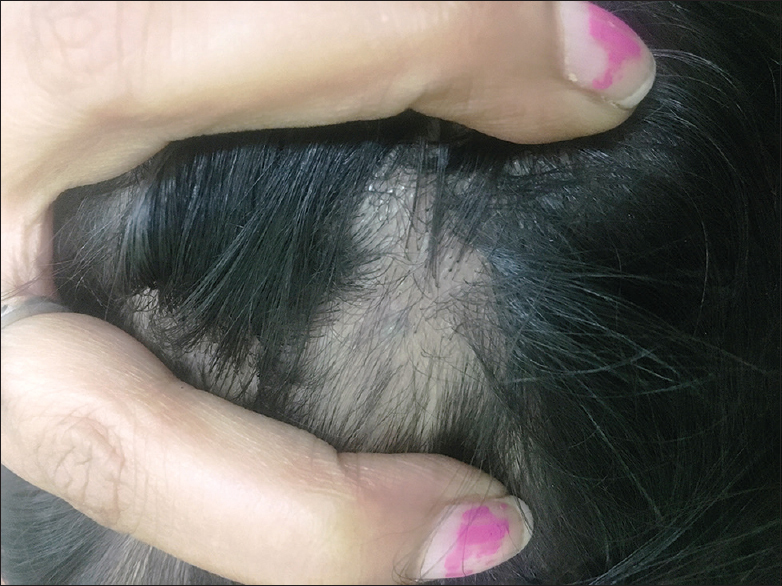 Grimalt R. Alopecic and aseptic nodules of the scalp and pseudocyst of the scalp: 2 different conditions or one single entity? J Cosmetol Trichol 2016;1:105-2. Lee SS, Kim SY, Im M, Lee Y, Seo YJ, Lee JH, et al. Pseudocyst of the scalp. Ann Dermatol 2011;23:S267-9. Rodríguez-Lobato E, Morgado-Carrasco D, Giavedoni P, Ferrando J. Alopecic and aseptic nodule of the scalp in a girl. Pediatr Dermatol 2017;34:697-700. Bourezane Y, Bourezane H. Two new trichoscopic signs in alopecic and aseptic nodules of the scalp: “Eastern pancake sign” and comedo-like structures. Ann Dermatol Venereol 2014;141:750-5. Abdennader S, Vignon-Pennamen MD, Hatchuel J, Reygagne P. Alopecic and aseptic nodules of the scalp (pseudocyst of the scalp): A prospective clinicopathological study of 15 cases. Dermatology 2011;222:31-5.